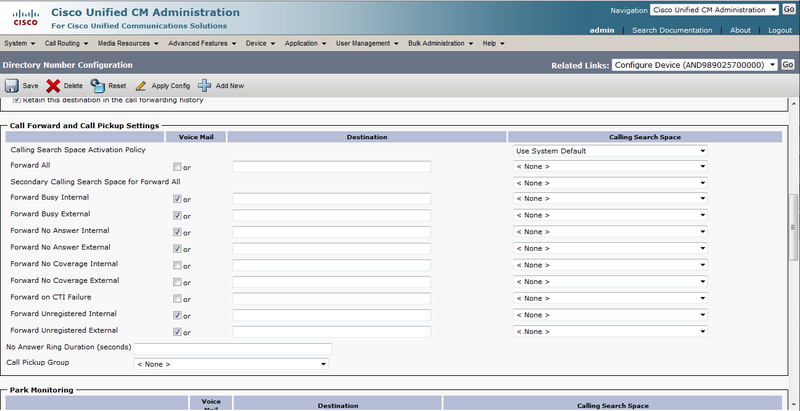 CUCM voice mail implementation can be quite intimidating without any prior experience to implement it. The tutorial credit goes to this video. This post is based on the video tutorial, please watch the video tutorial and support the original author. Message Waiting Indicator off number. 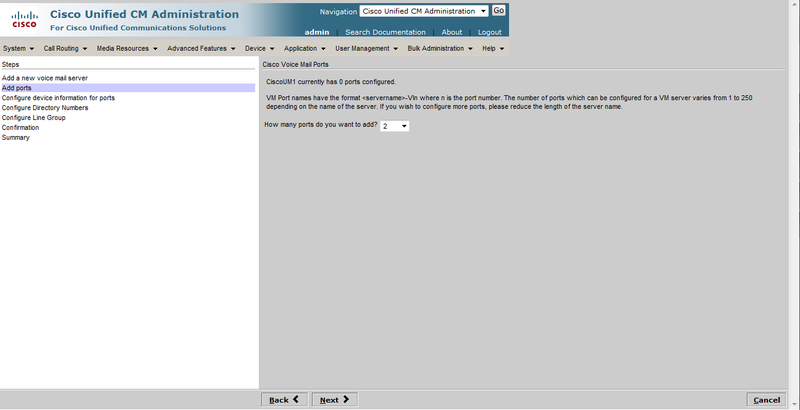 The Cisco Unity Connection demo license allows you to create only two voice mail ports. 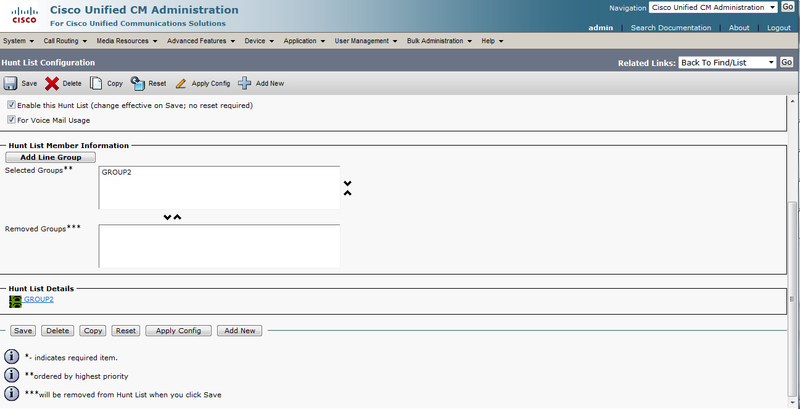 Choose “Create a new voice server and add ports to it”. Typed in an arbitrary name. 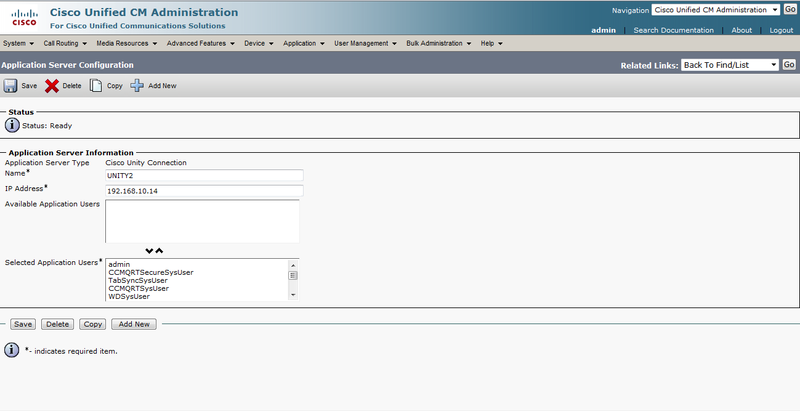 Since this is demo license, choose 2 ports. Choose a number to begin. If two ports are chosen, and the starting number is 5001, another number would be 5002. Line group has not been created. So I will add later. This is the confirmation page, if everything is fine just click finish button. 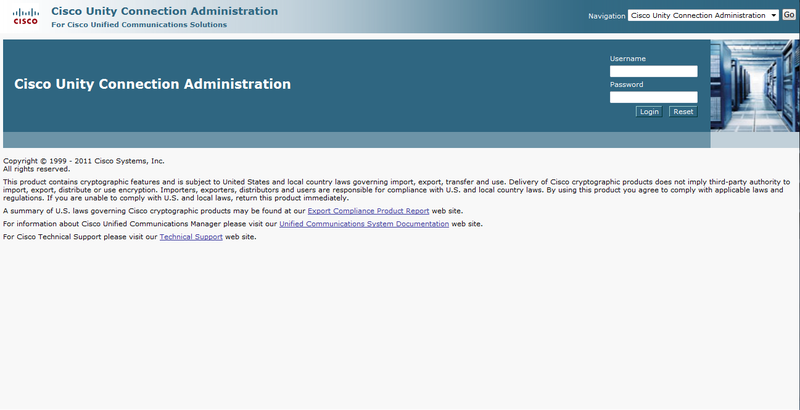 This is the summary page which presents things configured. I should go to create Line Group first. 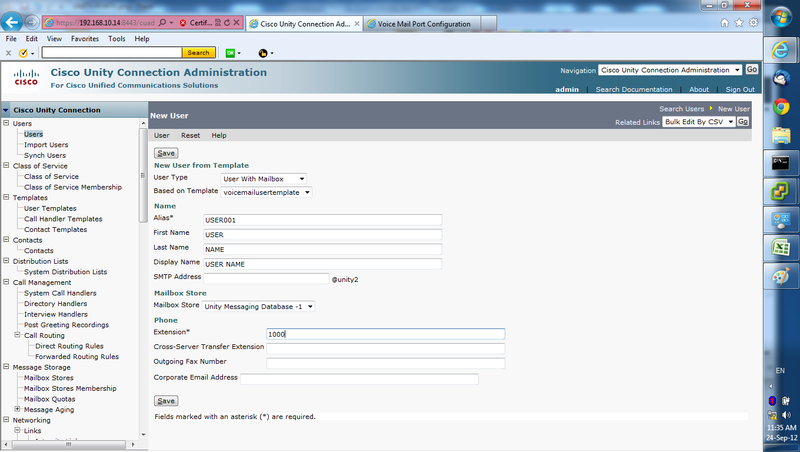 Add the two voice mail port numbers into the group. 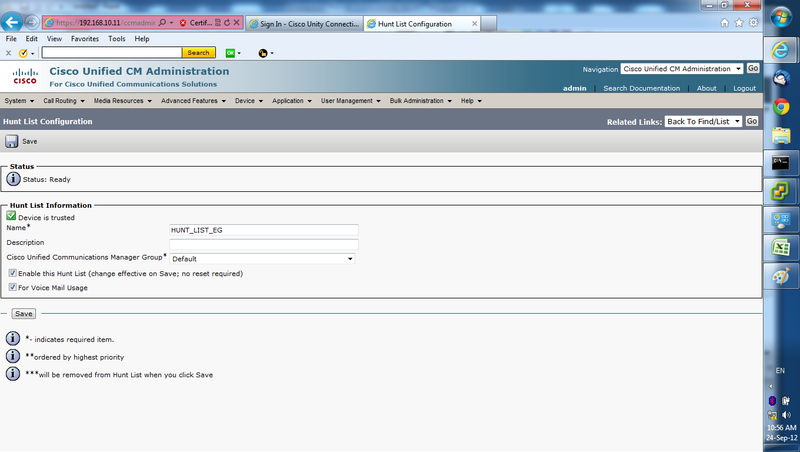 Create a hunt list as shown, more options will be displayed once the hunt list is created. The new options are displayed after the hunt list is saved. Click on Add Line Group button. Add the previously created Line group into the hunt list and click Save button. 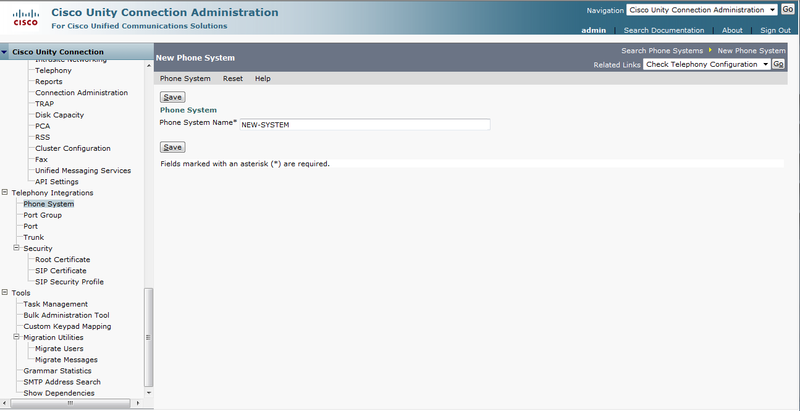 Enter an unused directory number for the Hunt Pilot number. This hunt pilot number will be added to the Voice Pilot. This will also be the voice mail directory number where user can call this number or press the voice mail button on his phone to access the voice mail. These are the remaining options of the Hunt Pilot page, leave it as default because we are using Unity connection the rest of the options are trivial. The Voice Mail Pilot Number is the Hunt Pilot number which previously created. Create a Voice Profile and insert the Voice Pilot. Create a phone profile if you have not done so, for this example I have already got all the phone devices added. I will choose a phone device to add the voice mail as an example. One Associate Information section add a directory number if your phone does not have one, for my case there has already been a directory number, hence click on the number. 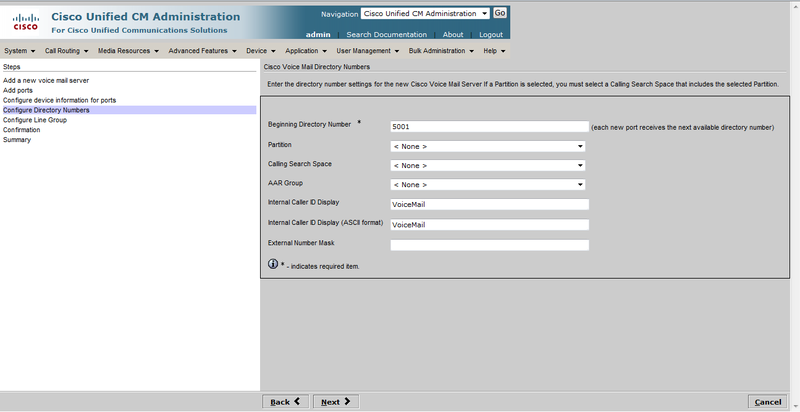 Scroll down to the Directory Number Settings, Choose the voice mail profile which created previously. 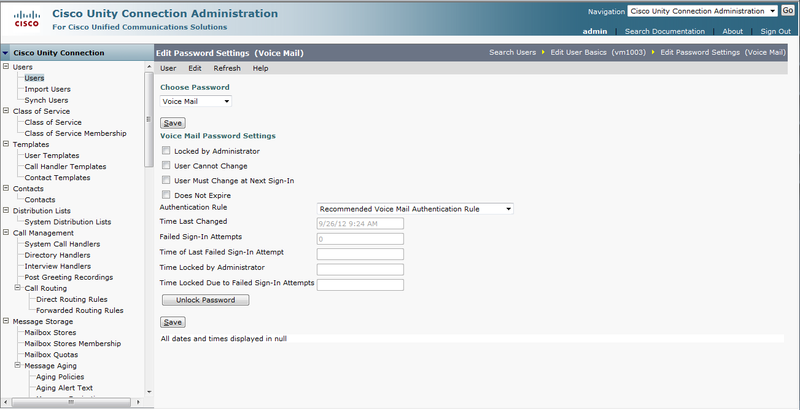 Choose at least the Forward No Answer Internal, then the “Forward No answer external”, “Forward Unregistered Internal” and “Forward Unregistered External” would be selected automatically. 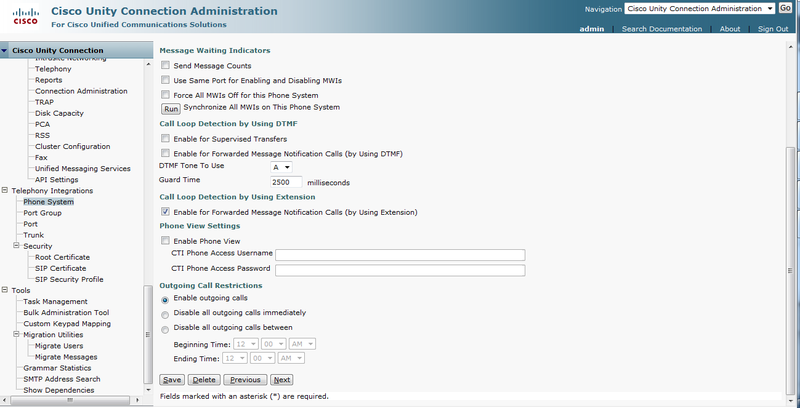 This means if the phone is unregistered to the CUCM or no one answer within the default 10second, the call will be forwarded to the voice mail server, which the number in this example is 5000, the caller will then hear a recorded message to ask to leave a voice mail. 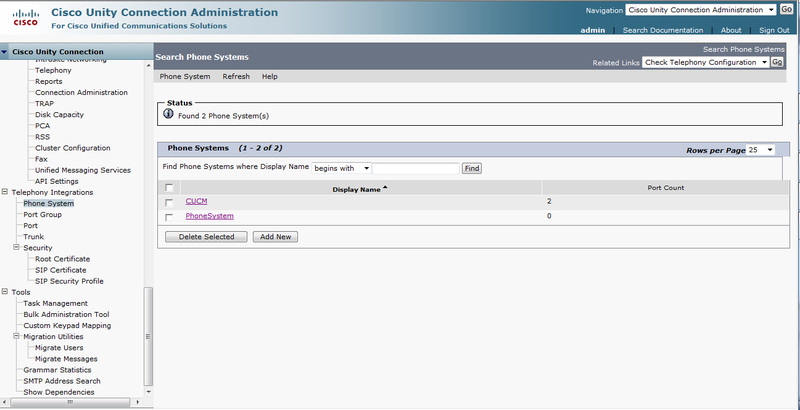 From Telephone Integration choose Phone Systems. 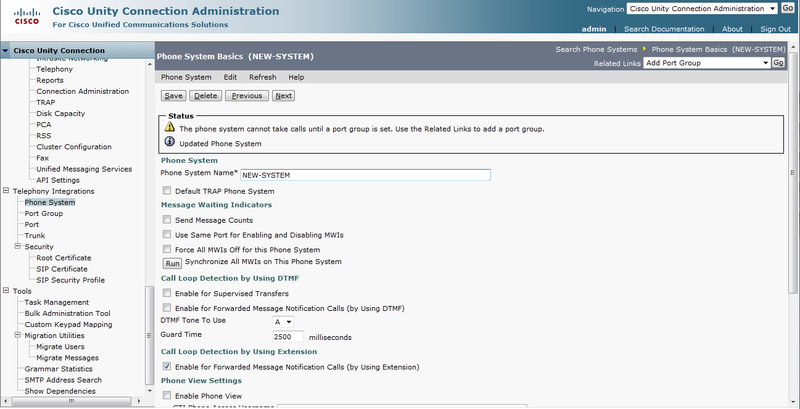 There is existing default Phone System profile, and one CUCM profile which I created prior to writing this post, for the sake of completeness of this post I will create a new profile. 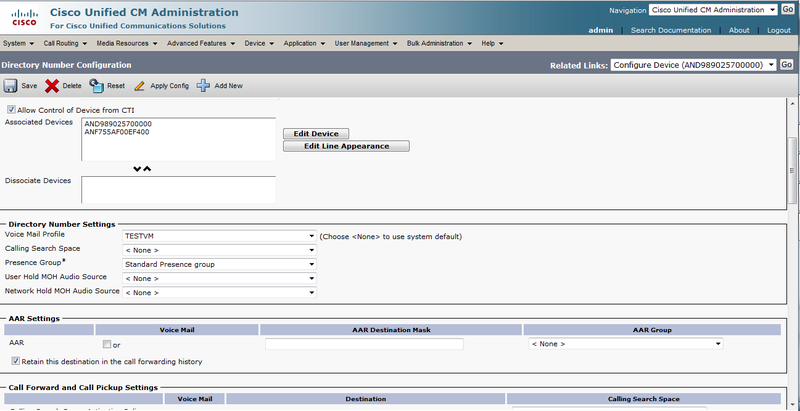 Choose an arbitrary name for the phone system profile and click save. More options are available after I clicked save button. 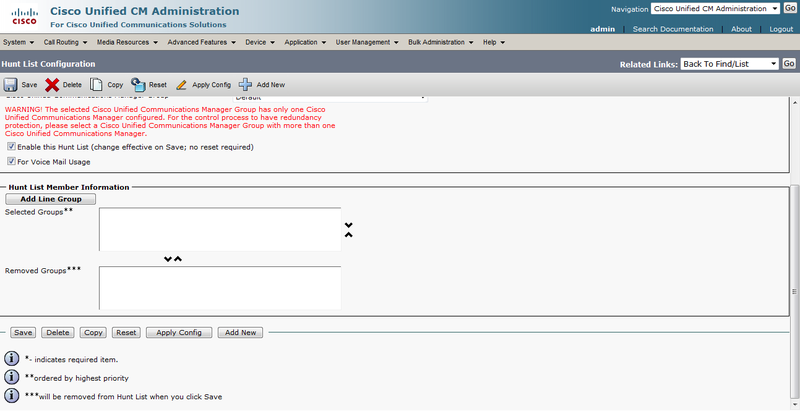 The warning tells me that I need to create port group in order to make it works. 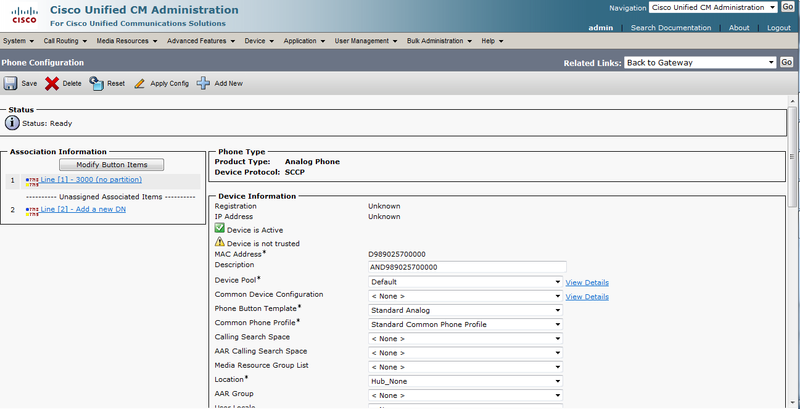 The Device name prefix is actually referring to the voice mail ports which created from CUCM, remember that I have created two voice mail ports? 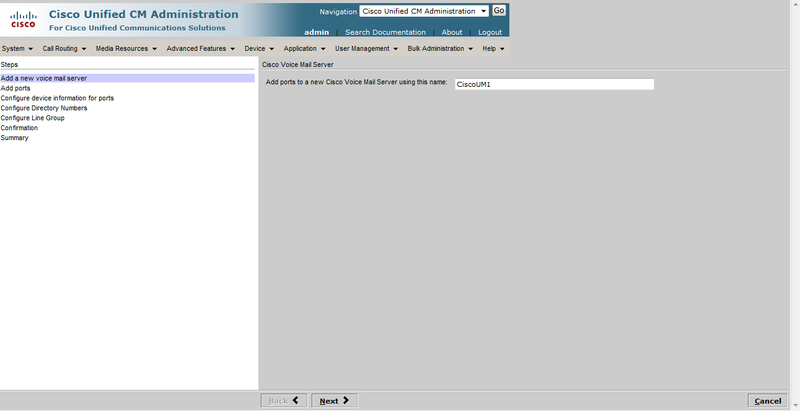 CiscoUM1-VI1 and CiscoUM1-VI2, the CiscoUM1-VI is the prefix that I need to enter, the prefix is depending on which name you gave to your voice mail ports. 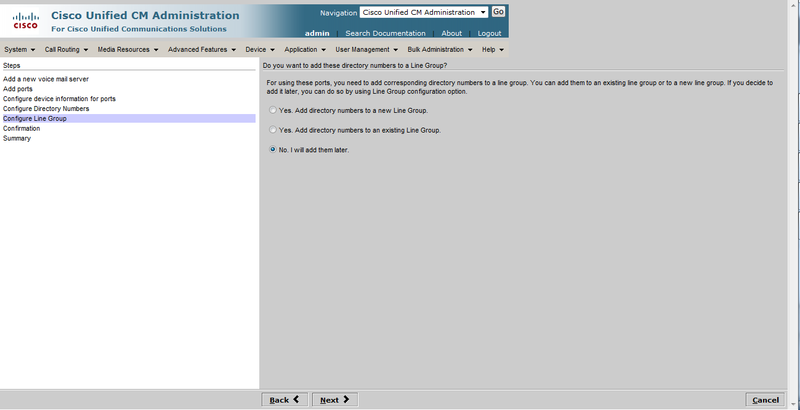 Then Put in the MWI on and off numbers created from CUCM. 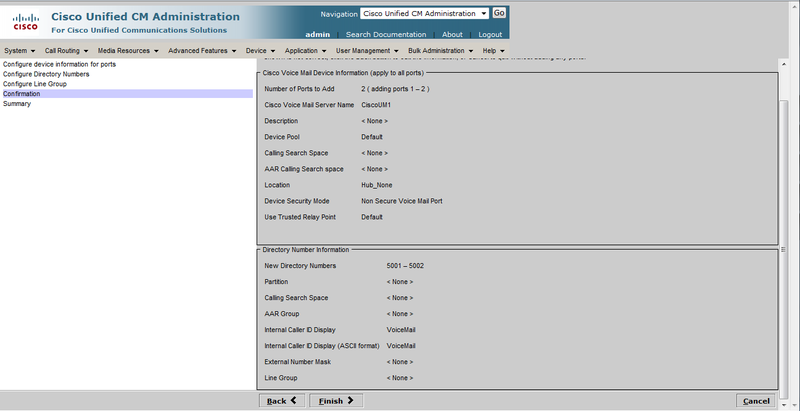 Under Primary Server Settings, the IPv4 address is the address of the CUCM. Click save. 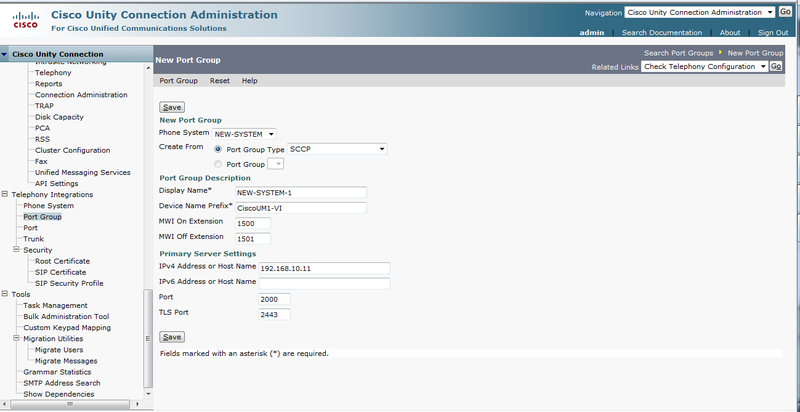 Create port, and add the port group and phone system profile to the port. Additional options will be available after new user is saved. 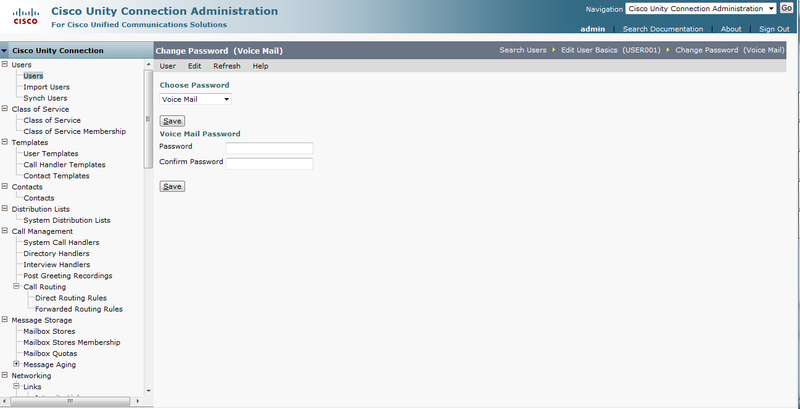 Click on Edit menu and choose change password of your newly created user. 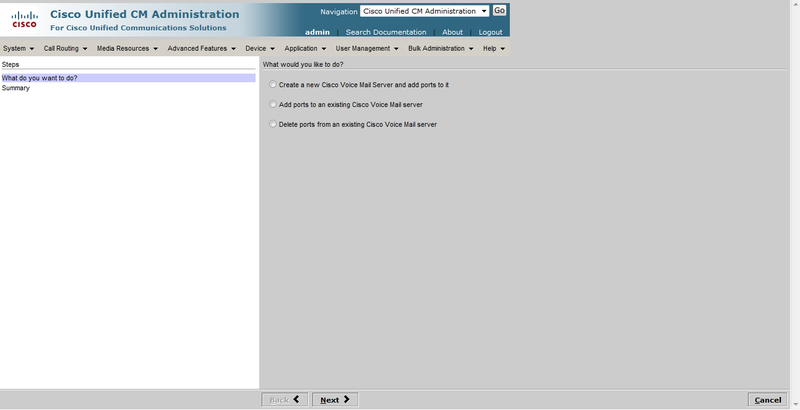 When your Cisco IP Phone first access the voice mail server (unity connection) you will listen to a lengthy voice message which is actually the tutorial, personalized your settings if you wish or press # to finish the tutorial, after the tutorial you will be able to access your voice mail messages. Add unity connection into Application Server. The Applications which CUCM supports. 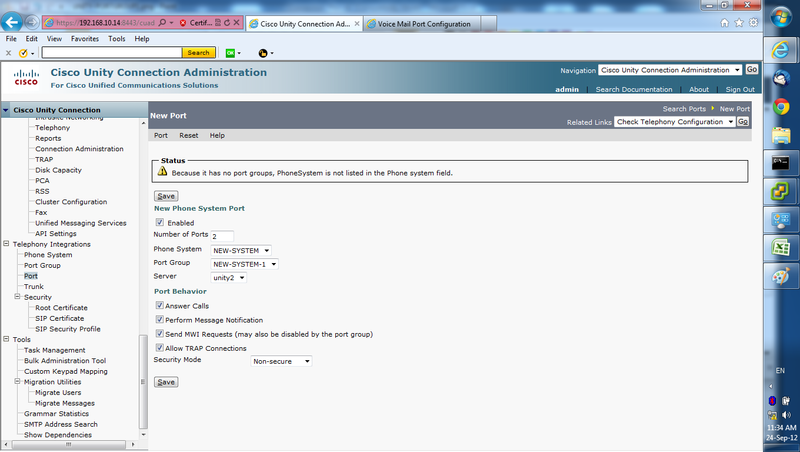 This entry was posted in IP Telephony and tagged Cisco unified communication manager, Cisco Unity Connection, how to configure voice mail, ip telephony, Voice mail. Bookmark the permalink. I´m going to install Unity Connection. 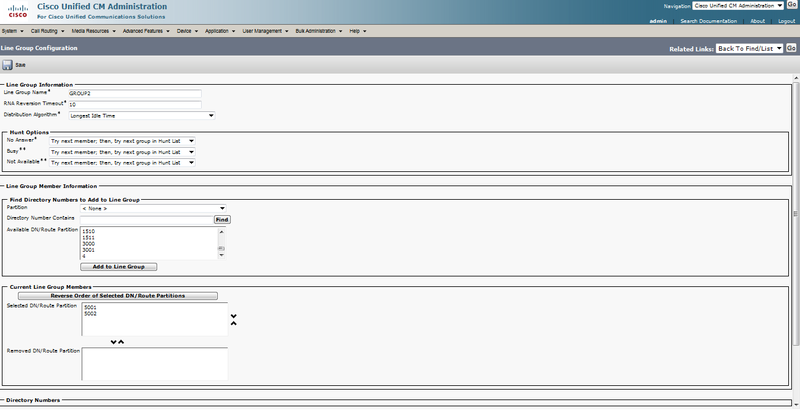 I need to know how many voicemail ports i should set in the Wizard. We’re a Cisco Solution Partner specializing in software development for Cisco Collaboration and Contact Center solutions. We’d also like to publish a tech article on your blog cyruslab.net.